Growing up with my self-made mechanic dad, I always helped him out with fixing our family’s cars… from changing burned-out signal lights to the replacing the calipers on the brakes. This is why I now have a great appreciation for automotive designs and accessories inspired by this world. Over the past couple of years working here at WorldofWatches.com, I’ve come across some really cool watches that I keep in mind for future gifts for my dad, especially for Father’s Day, which is fast approaching (trust me, it’ll get here sooner than you think). Red Line has a great choice of sporty styles that guys with a taste for all things cars can appreciate, My favorite is the APEX12 chronograph. At first glance it may seem like a simple chronograph, but upon second inspection, you will notice the sub-dials’ indices look like the registers on a car’s dashboard and the hands resemble the gauge indicators on a speedometer. To be honest, I would even wear this watch. I mean, I am the one with a sports car after all, so it only makes sense that I have an accessory to match my bright red Pontiac G5. My dad could borrow it from time to time if he wants (the watch, not the car). If you’re looking for something a little more upscale and with that same full throttle attitude, Porsche Design has a few choices. Who better to give you a luxury race car experience than Porsche? Man, what I’d give to drive one of those bad boys. For now though, I’ll settle for one of their timepieces. The blocky, stylized Arabic numerals on this Flat 6 timepiece from Porsche Design are reminiscent of the readings in the driver’s display area of a Porsche race car. The sleek black and grey color scheme brings that need for speed look together and the numerous indices around the edge create a warped speed appearance that’ll really get your heart racing. Don’t forget the watch’s smooth automatic movement that’s like the purr of a well-kept engine. Okay, so maybe you’re looking for something with a little more flair. You want something that says I drive a ZX on the streets and I belong in the Daytona 500. Well, gentlemen, start your engines, the Invicta S1 Rally collection has something for you. The two designs featured here are my particular favorites. The bold Tonneau case makes a lasting impression on your wrist while the overlapping chronograph on the dial gives off a racetrack vibe. For the round GMT S1 Rally, the racing stripe color scheme really pops in contrast with the white dial and you’ll have people looking twice. Alright, I’m gonna take a moment here to give a little rant. Where my ladies’ sports watches at? I mean c’mon, women like cars and racing too! Haven’t you guys ever heard of Danica Patrick? 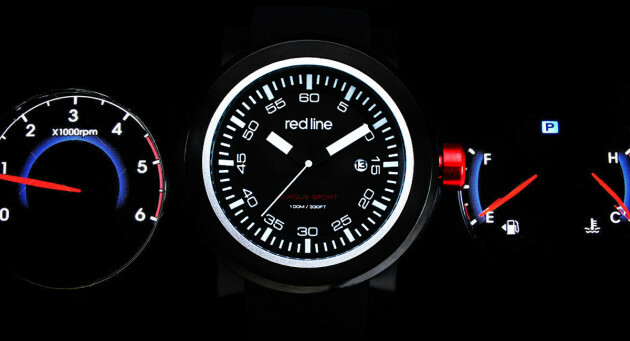 I think it’s time we get some auto inspired watch designs of our own, don’t you? For additional Father’s Day watch selections, be sure to check out our Father’s Day Gift Guide. World of Watches Takes off To Italy: Fine Italian Quality at Unbelievable Discount Prices. Extensive Invicta Watch Discounts. Only at World of Watches.